We don’t usually do much for Memorial Day weekend and this one has been no different from the rest. I had to teach a class Saturday and Sunday. I also had to get the girls to and from their last sewing class on Saturday before they break for summer. Frank headed to Jefferson City on Saturday, where our son was participating in the State Track Meet. Out of 16 discus throwers, he placed 5th and we are mighty proud of him! He didn’t make the top four, but he did receive a medal for his efforts and he was really excited about that. This evening we decided to have a little barbeque and invite our in-laws from next door to the north of us and our neighbor Tim, to the south of us. We grilled pork steaks and I made mashed potatoes and fresh asparagus sauteed in lemon infused olive oil sprinkled with sea salt. That’s my favorite way to prepare it. For dessert we enjoyed a lemon cake with lemon frosting along with a side of ice cream and strawberries that I picked from the garden this morning. We’ve got a nice patch of strawberries this year, I only wish I hadn’t planted two different kinds. I’m finding one kind is way better than the other, but who knew? After dinner we ventured out onto the deck in the dark. The fireflies were lighting up the back yard big time and it was quite the show. Frank and Tim decided to entertain us as they do sometimes, but not often enough if you ask me. 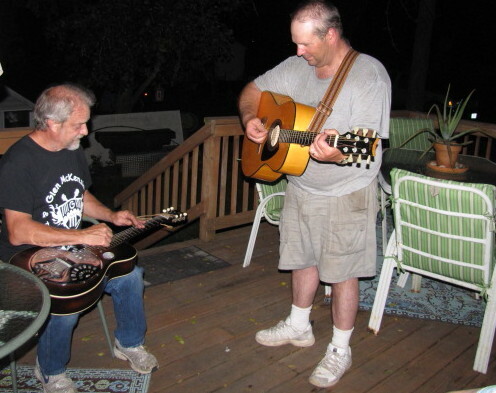 Frank played his guitar and Tim was on his dobro. What a beautiful instrument. Not only in the way it looks, but in the way it sounds and how he plays it. Together I think they sounded great and had a pretty good time. It’s the little things like live music on the deck until 10:30 p.m. that make me appreciate the life that I have even more. Tim and Frank, thanks for a relaxing and entertaining evening! 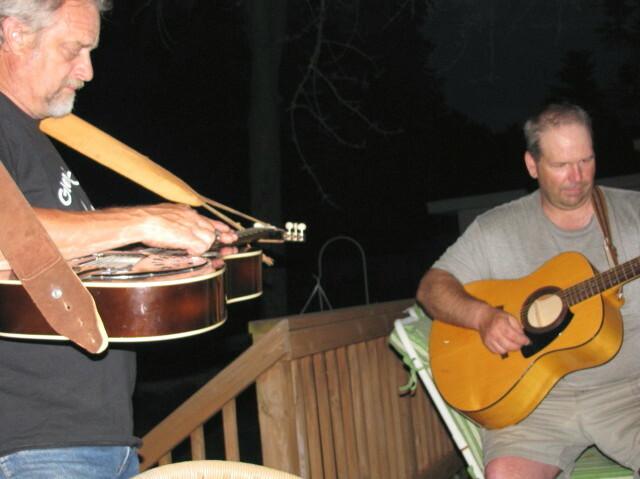 Categories: family | Tags: dobro, family, friends, guitar, strawberries | Permalink. The New Year’s Day Yoga Mala was quite a success, as always! At the beginning, my daughter counted 63 people. There were more that rolled in, so I believe it’s safe to say we had around 70 for sure! Beth and Eric did a fantastic job with the live vibration. They are an amazing team for sure! I chanted the second set with Beth and it was so much fun! We took in $78 in cash and I dropped off the food that was donated today, and it weighed in at 303 lbs. Wow. That’s a lot of food. We had several people with cameras running around, so as soon as I get the rest of the photos, I’ll have something up on the web site, and of course get a newsletter out to the world. I’ll leave you with these photos for now. After the Mala, we headed up the street with fresh flowers (that I forgot to bring to the Mala….shhh…don’t tell anyone) and a bottle of wine, to have dinner with some friends, L & M. They met in Europe a few years ago. M is a British tour guide who still travels the world. He happened to be the guide for the tour L was on with her students. Thankfully for us, they fell in love, got married and made their home base here so we can enjoy his accent, sense of humor and the amazing food they prepare together for us! We started our meal with a tomato, mozarella and avacado salad drizzled with something out of this world. I’m sure it was something simple like olive oil and lemon juice and basil, but it’s always way better when someone else makes it! Why is that?!! Next up, they served us beef burgundy with some awesome potatoes that had a bit of a mustard flavor. Good stuff, and of course, they served it with a great bottle of wine that made it even better. For dessert they whipped fresh cream, made the best coffee ever and we enjoyed a lemon curd patisserie for dessert. Thanks guys for one of the best meals ever and of course the company rocked as well. What a perfect start to the New Year, first Yoga, then Family, Food and Friends. Categories: Yoga | Tags: 108, day, family, food, friends, mala, new, salutes, sun, years, Yoga | Permalink.